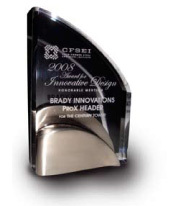 As a leading innovator of Metal Framing Efficiencies Todd Brady is often published and his product brands are frequently featured in leading trade magazines. Some of the more recent articles are posted here for your review along with some project profiles. ProX Header - Better Protection, Better Safety, Better Quality. Brady Construction Innovations and Dietrich Metal Framing Named as Quality Materials used by Brady / San Diego, AWCI’s Construction Quality Award Winner.